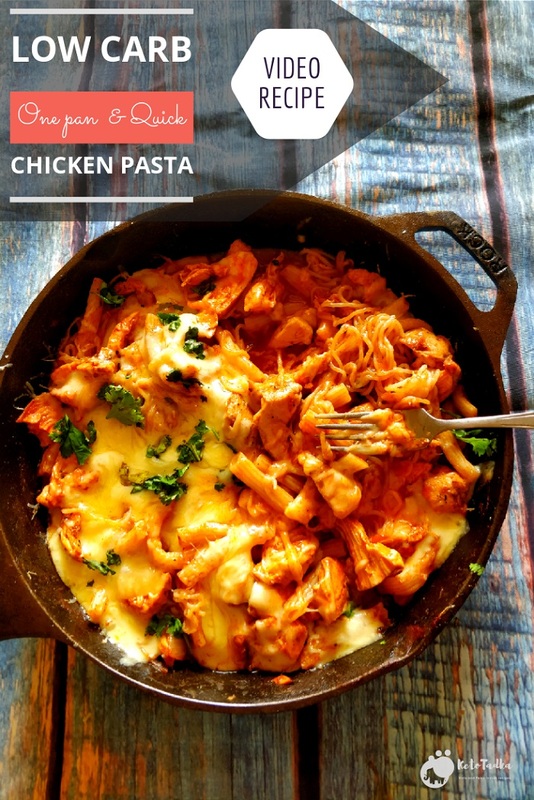 Low Carb Chicken Pasta is what you need for this festive season. 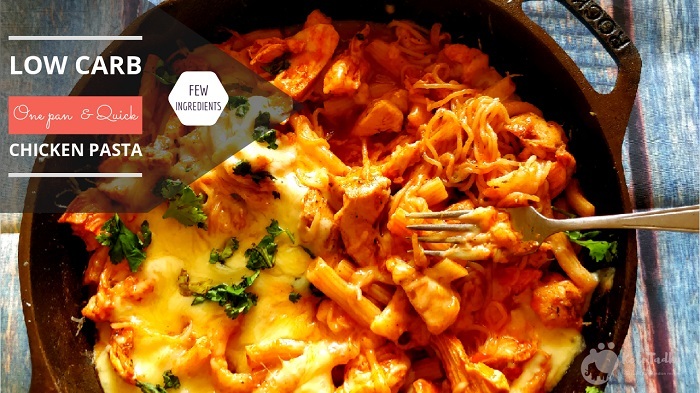 It’s warm, easy to make and guess what- it is ready in few minutes in a single pan. The Shirataki noodles are very low and almost zero in carbs but they are not available in India. Indian Low-carb Alternative for pasta is the SLIM PASTA NOODLES/PENNE available on Bigbasket. They are not strictly keto but are good low-carb options if eaten in 2 portions. Remember to wash the noodles with some gentle flow of water to take away the smell of konjac. You can use the puree I used or make puree at home with 2 medium tomatoes. You can use either grilled / rotisserie or boiled shredded chicken. Chicken I used in the recipe was grilled but was a bit larger in size than I wanted. Make sure to use small sized shredded pieces. Iron skillet is Best investment ever !!! You can use it to make almost anything – Be it pies, desserts, cakes, eggs, fry , sautee – You name it ! And it works on the stove, microwave as well as the oven. Grill or broil the chicken and shred it . Keep it aside. Season it with some pepper if you like. Add the Italian seasoning . Add the pasta and chicken, Mix well. Add the broth and mix well, Let it cook for 7 minutes till the water evaporates.